History: Not moving left leg, flexion contracture at the knee. Other past medical history includes hyperbilirubinemia at birth, autoimmune hepatitis, sensorineural hearing loss and global developmental delay. 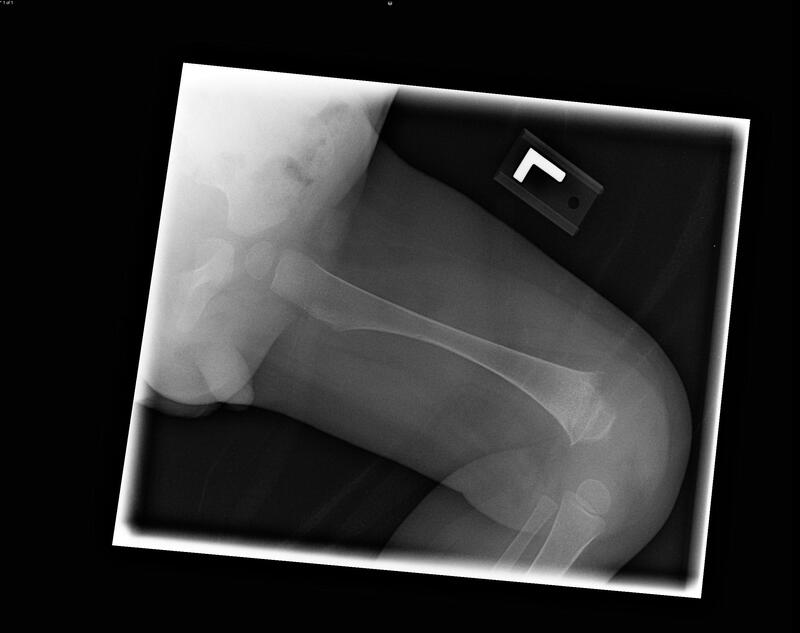 Frontal radiograph of the left femur at 1 year old 2 months demonstrates flaring of the metaphysis and fragmentation of the distal femoral epiphysis. 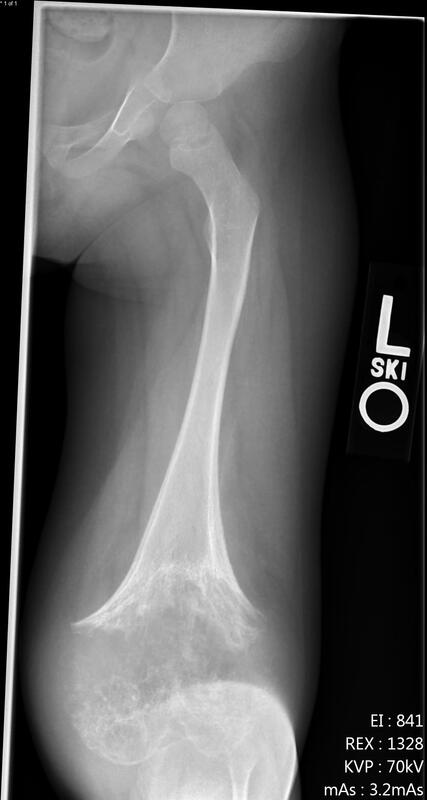 Lateral radiograph of the left knee at 1 year old 2 months demonstrates flaring of the metaphysis and fragmentation of the distal femoral epiphysis. 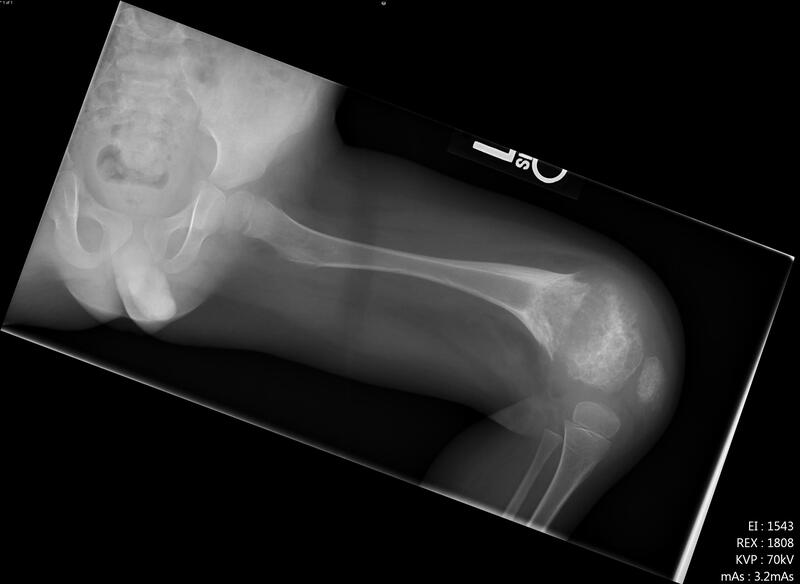 Neonatal onset multisystem inflammatory disorder: Frontal radiograph of the left knee at 3 years old 4 months demonstrates multiple curvilinear sclerotic areas of “rings and arcs” type of calcification, consistent with chondroid matrix, likely reflecting severe enchondral bony overgrowth of the physis. 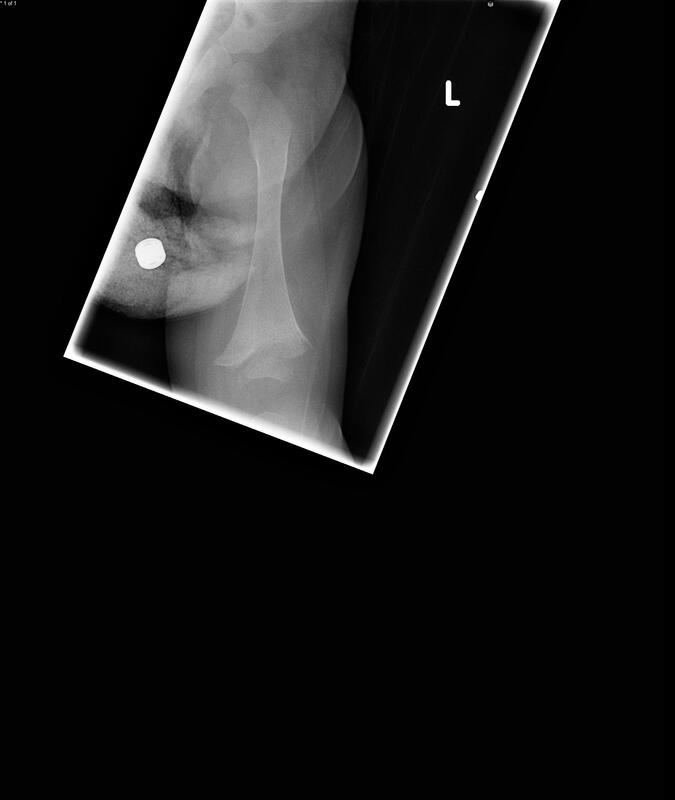 Neonatal onset multisystem inflammatory disorder: Lateral radiograph of the left knee at 3 years old 4 months demonstrates multiple curvilinear sclerotic areas of “rings and arcs” type of calcification, consistent with chondroid matrix, likely reflecting severe enchondral bony overgrowth of the physis. Neonatal Onset Multisystem Inflammatory Disease (NOMID) was first described by Prier and Griscelli in 1987 and has also been referred to as chronic infantile neurologic, cutaneous and articular syndrome (CINCA). It is a rare genetic disorder on the spectrum of cryopyrin associated periodic syndromes (CAPS). NOMID is associated with mutations in the NLRP3 gene in 60% of patients, which was confirmed in our case. According to the NIH, approximately 100 affected patients have been reported worldwide. Other CAPS entities include familial cold autoinflammatory syndrome (FCAS) and Muckle-Wells syndrome (MWS), of which NOMID is the most severe.